The Andhra Pradesh ePass Scholarship Online Application forms are opened in online from the official website @ epass.apcfss.in. The aspirants who are eligible can apply for this AP ePass Scholarship in online only. 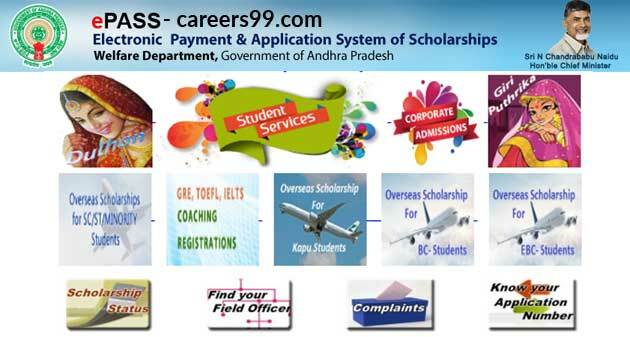 The Government of AP declares the ePass Scholarship Application forms in online itself. The candidates who are studying in the AP ePass System check the scholarship application forms and status from the below paragraph. Read the article we mentioned the details about AP ePass Scholarship Scheme. AP ePass Scholarship Application Forms are available soon. Candidates fill the application form we provided the direct link to access the application form from the below. This AP ePass Scholarship Notification is introduced for the backward categories due to the financial backgrounds. Every year several numbers of applicants were getting back to schools and colleges due to financial circumstances. Actually our ex-chief minister introduced the scheme in the form of fee reimbursement, scholarships. With this scholarship some of the candidates have completed their studies. But this scheme is available for only the candidates whose family income is less than 1 lakh. The candidates who are going to apply for this AP ePass Scholarship you have to fulfil the eligibility which was mentioned by the government of AP. There are various application forms for this AP ePass in online. The candidates based on the categories will get the scholarships for the academic year 2018 -19. To get more details you can hit the link @ epass.cgg.gov.in. As per the rule and regulations the AP ePass online application forms shall be completed within the time limit. The candidate has to fill the ePass Application form before the last date. If you submit the application lately the commissioner will not be considered the AP ePass Application form. All the candidates please check the last date and fill the application form in time. As we all know the applying aspirants whose family income must not exceed 1 lakh. Candidates who fufill the eligibility criteria can move to the further process. You can follow the below process for the candidates who applied for AP ePass Fresh & Renewal application forms. Aspirants belongs to SC, ST and the parents income must not cross 2 lakhs are eligible to apply for this scheme. The candidates who belong to the BC, EBC & disabled persons the parent’s income should not cross 1 lakh. The candidates must attend the colleges and the attendance must be 75% at the end of the annual year. Students who applied under Andhra Pradesh ePASS system can check your ePass Application status & Scholarship Status from below links of Official Website. Candidates can check their AP ePASS Status from this page. We have provided the direct link to check the AP ePASS Status.